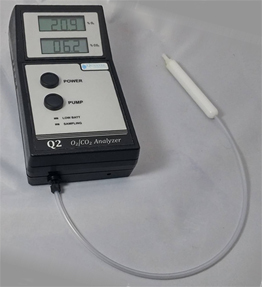 The Q2 is a Portable Oxygen and CO2 analyzer, used for research or package testing.The Q2 is a portable headspace analyzer for measurement of O2 and CO2 levels in gas flushed MAP packages (such as coffee or meat products). Alternately, the Q2 can be used for portable O2 and CO2 measurements for research applications (such as cell culture incubators). It weighs only 2 lbs, and comes with rechargeable batteries, sample probe, charger, and accessories to begin sampling. There is also an optional hard carry case for easy portability and protection. The Model Q2 incorporates the latest fast response O2 and CO2 sensors, which allows results to be obtained in 15 seconds for rapid spot checks. The oxygen sensor is also rated for 5 years of life, which is far better than the competition. Other analyzers utilize cheap oxygen sensors which may last 18-24 months. EASY SAMPLING METHOD Our standard sample probe assembly for food package testing connects to the Model Q2 – this sample probe is interchangeable with all of our other analyzers, and is a durable double tubed, single piece. The probe is tipped with a liquid blocking filter and tri-beveled, non coring needle. The filter will block liquid and particle intake into the analyzer, and the needle is specially designed to prevent “coring”, or plugging, and is incredibly tough. On the side of the instrument there are five adjusting potentiometers – you can adjust the oxygen span, pump time, CO2 span, and other parameters on the fly. There’s no need to reboot and no need to warmup – it’s as easy as it gets. The infrared CO2 sensor utilizes NDIR technology for maximum stability, and has a theoretically unlimited lifespan. Its ultra low power consumption allows for 10-14 hours of runtime for the analyzer before recharging is required. The electrochemical O2 sensor life is typically 4-5 years, unlike other analyzers with an electrochemical sensor that last 1-2 years. When required, replacement is easy and inexpensive. The Model Q2 is backed up with a two year warranty, twice the industry standard. Our service team responds quickly to the repair needs of our customers.